Cassie Leatham is a Taungurung/Wurundjeri woman of the Kulin Nation. 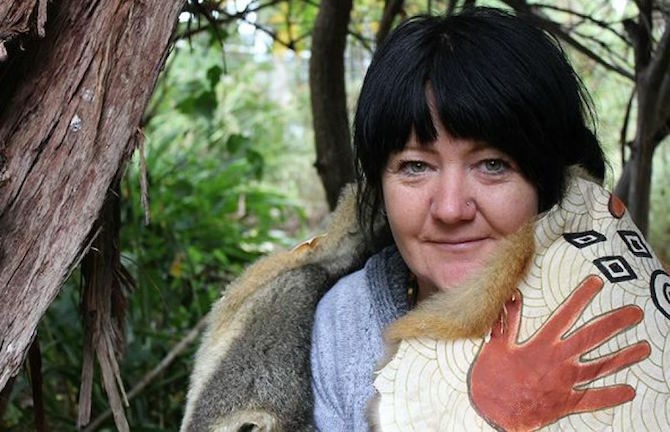 Cassie was born on Gunai Kurnai country and is an active member of the Indigenous community and member of Ramahyuck Aboriginal Corporation in Sale, Gippsland. Cassie’s father Ron is a senior Elder at Ramahyuck. At a young age Cassie demonstrated a talent in art using a variety of different mediums and techniques and it was through discovering her Aboriginal heritage that she began exploring traditional ways in Aboriginal artefacts and creating arts and crafts using traditional materials and methods. Cassie is self taught but listens to the stories from Elders’ stories to inspire her pieces. Cassie has devoted her time to teaching Koorie youth these methods and techniques, as well as non-Indigenous people. Cassie has taught culture and art in numerous schools in Gippsland and surrounds and was a recent participant in Museum Victoria’s exploration of the Gippsland Lakes with scientists. Cassie has taught music in schools around Gippsland and has worked as a community ambulance officer. Cassie was a finalist in last year’s Victorian Indigenous Art Awards with her Emu Feather Dancing Skirt. Cassie has had two solo exhibitions, plus works in numerous exhibitions in Victoria. She was also a part of the Darwin Art Fair. Cassie has been teaching culture, art and bush tucker for the past five years and is a Koorie youth mentor with Victoria Police at Lakes Entrance, Victoria. Cassie has also taught Monash University second year medical students about bush medicine and the identification of bush plants and their uses. Cassie is determined to break down barriers between people Indigenous and non-Indigenous and to teach old ways to youth so the culture never dies. It’s this determination that keeps Cassie motivated in all aspects of her art and crafts.